This strategy can be very effective in studying related words on a continuum (Reading Rockets). Students gain experience with different levels of the same word such as big, large, grand, and huge. Even though all of these words mean close to the same thing, they describe different extremes of the word. What makes this strategy so helpful for struggling readers is that there is no right or wrong answer for brainstorming synonyms of words. Lower students will not come up with higher vocabulary words, but can still participate by providing easier synonyms. To begin this strategy, you would place two antonyms on the opposite ends of a line. Next give students a group of words that belong somewhere on the lines. Making sure that if a word is closer to one end then the other that it doesn't end up passed the middle if the line. Below is a video of students completing a continuum. Teachers many times use a text that includes a lot of the words students are placing on the continuum. It is amazing how students are able to figure out where words go based on what they know of other words. Sometimes the words are unknown, but students are able to recall a time when they saw the word and the experience associated with it. All in all, students practice with this strategy can allow them to be more creative and imaginative in their writing by using words they may not normally use. 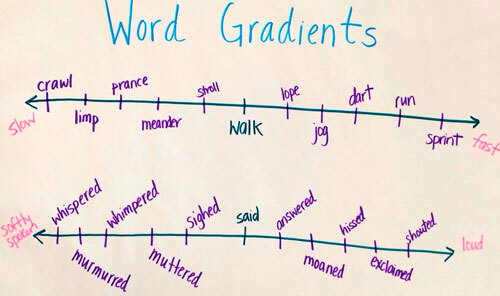 As students read more stories, they can continue to create their own semantic gradient posters and place them in the writing center (Jennings, Caldwell, & Lerner, 2014).